This extension method expects a date type as a parameter. 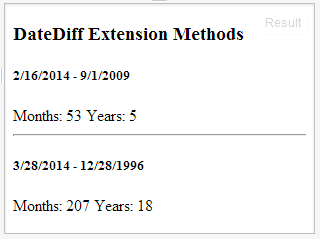 It uses native functions to calculate the years and months difference between itself (this) and the date parameter. Now that we have our new functions available, we can work on showing a way to use them. We can do that by comparing a couple of date ranges to display the difference in months and years. In our examples, we use the most recent date as the extended object, and pass the before date as the parameter. This allows us to get positive values for the date difference calculation. The result should look as shows below. We can also use this JSFiddle sample to see it in action. Thanks for following and keep an eye for additional entries. 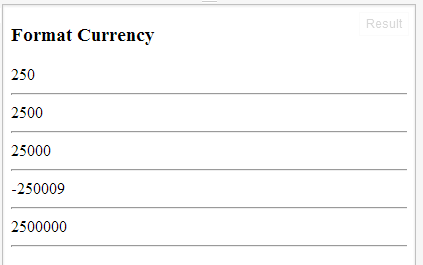 When working with currency, there is a need to format the data with commas, decimals, currency sign and an indicator for negative amounts. Let’s take a look at one approach that can help us format the data once it is rendered on the user interface. We start by taking a look at a page that displays several numeric fields with no styles. As we can see, these numbers are hard to read. It will be much better to just add commas and a different font for negative values. We can do this by using a CSS selector and select all the elements that we want to format. The approach here is to use the Number.toLocaleString function to format the data with commas. This provides the ability to eliminate the use of regular expression to parse the data. 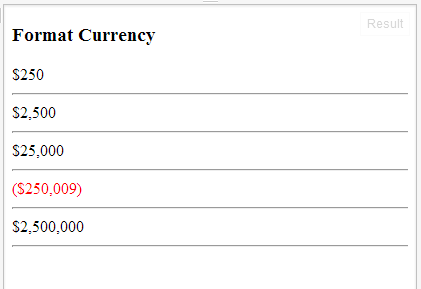 Now we need to add the currency sign and use a red font for negative amounts. We do this by applying these CSS classes.